Young students learn to read and write Arabic in Qu'ranic schools. 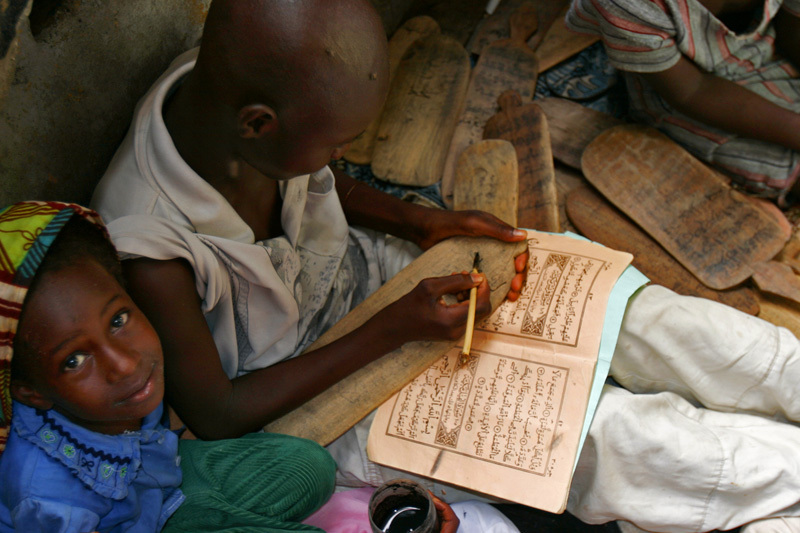 Copying the Qu'ran and other Islamic texts on to wooden tablets using pen and ink helps children memorize these writings while they practice their penmanship. The writing board is called an Aluwal. The Sufi attach mystical meaning to the ink when the words are written. Boards like these are protected from anyone who might desecrate or misuse the power of the words. Some mystic Sufis carefully collect the water when the boards are washed to be used for healing and blessings. Mixed with some milk, the solution is the first to be put on a newborn's tongue.